Do you feel besieged by archaic appliances and outdated electricals? Whether you are running a household or a corporation, what to do with waste electrical and electronic equipment (WEEE) can be a vexing conundrum. Timeworn IT devices and electrical apparatuses such as televisions, frigdes, and coffee machines can waste away for years, inhabiting space that might be put to more productive uses. Many people are simply uncertain of how or where they should dispose of such items. Simply call Junk Collection and we will get the WEEE out of your way. We can schedule a time that is most expedient for you to have one of our teams dispose of your unwanted electronics and electrical appliances. We carry out all such clearances in full compliance with WEEE disposal regulations. Our team swiftly and efficiently clear your WEEE items without disturbing your workplace or your home. Our skilled teams are professionally uniformed, and are proficient in the safe and appropriate clearance of electrical machines and electronic equipment. As with all of our clearance jobs, we are committed to recycling or donating as much of the WEEE that we collect. Any items that are suitable for refurbishment and re-use, we donate to charity, where they may see many more productive years of usage. 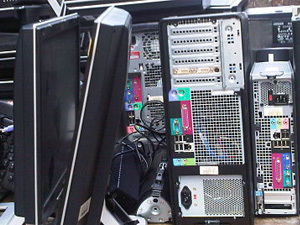 Contact Junk Collection for a free quote on WEEE collection services.